Scott Peterson on How SLOW Can We Go? We arrived in Rock Hall, MD on Tuesday, 19 May, anxiously awaiting the arrival of Dreamtime. She had been put on a transport truck in Canada on Friday, and had to wait for a Canadian Monday holiday (Victoria Day) before she was able to cross the border to the United States on Tuesday. The transport company kept us informed of her journey and around 1530 on Wednesday she arrived at the Sailing Emporium on her truck. Yay!!!! It was very exciting to see Dreamtime arriving. 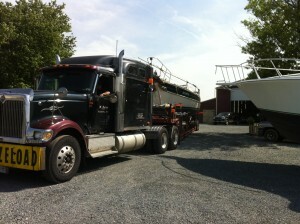 They got her off the truck and into the Travelift to spend the night before putting her in the water on Thursday. Where Dreamtime (the third from the left) has spent the past 2 years getting a refit. Last month we had the opportunity to travel to Goderich, Ontario, Canada for the Gozzard Owner Rendezvous (Reunion). 60 – 80 people attended (which represented 30 – 40 Gozzard boats) and it was a great opportunity to meet with other owners who are more than willing to share their knowledge and expertise about life on a Gozzard. 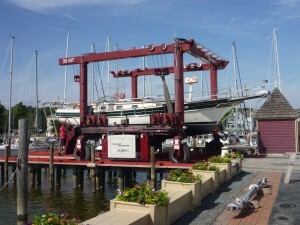 We have chosen to spend our first few months in the Chesapeake Bay at the Sailing Emporium in Rock Hall, MD. The first 2 couples we met at the reunion have been spending summers at the Sailing Emporium for the past 10 years and invited us to request a slip across the dock from them so the Gozzard family can be close to each other. We are looking forward to learning as much as we can from our new friends. Another group are planning to be in the Bahamas in the winter and are planing a reunion there at some point, which we will look forward to if we make it that far this winter. All in all, it was fantastic to find a community of boat owners who are willing to offer a network of support for us, the new Gozzard owners. Whilst in Goderich we were able to check out Dreamtime and see the work that has been done on her over the past 2 years. We are very much looking forward to getting her in the water soon.